MIL-RITE MEAT GRINDER ATTACHMENT, 45 R.P.M. or 92 RPM if used with Mil-Master model 19. THIS MEAT GRINDER ATTACHMENT WILL FIT ON ALL MIL-RITES and Mil-masters WITH REVERSABLE SWITCHES. This attachment can also be used with our heavy duty 12 inch cast iron flywheel (part # RP196) if desired. 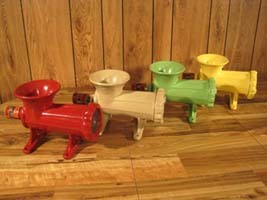 This meat grinder can be used to grind sprouted grains, grinding masa dough directly from wet nixtamal (corn boiled in alkali), wet corn or any other difficult to grind grains. QUALITY American MADE, made WITH RETSEL high carbon PRECISION CUT BLADE AND AUGER. CAST IRON CONSTRUCTION, CHROME PLATED. WILL GRIND APPROXIMATELY 30 LBS OF MEAT PER HOUR. IT IS NECESSARY TO REMOVE THE MIL-RITE FROM THE BASE IN ORDER FOR IT TO BE SECURELY FASTENED TO THE MACHINE. A COUPLER IS INCLUDED WITH THE MEAT GRINDER FOR A QUICK AND TROUBLE FREE CONNECTION. OWNERS MANUAL INCLUDED WITH THE ATTACHEMNT SHOWING THE PROPER WAY TO ATTACH THIS UNIT TO THE MIL-RITE. 30 DAY RETURN SATISFACTION POLICY APPLY. 10 YEAR WARRANTY ON ALL PARTS AND LABOR, INCLUDING THE CARBON BLADES. GIFT CERTIFICATES ARE AVAILABLE. SUGGESTED RETAIL PRICE IS $398.95 All our products are made in USA. Due to our strict quality control standards and supplier manufacturing deadlines our delivery time may vary depending on which color and item you select. The standard delivery time on all our products, repairs and special order items is 1 to 2 weeks at this time. Please call us at 208-254-3737 during our regular business hours before placing your order to find our current delivery schedule is at this time.